Maître-cylindre de frein Ssangyong Korando 2.9 TD HERTH BUSS JAKOPARTS. 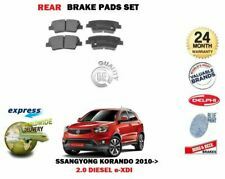 Pour Ssangyong Korando I (L2B/L2A). JEU DE MACHOIRES DE FREIN A MAIN - Neuves - F H S01. Diamètre : 190 mm. A partir de 1993. Le jeu de 2. AUTO PIECES DE L'OUEST. 44800 SAINT HERBLAIN. Fuel Type Diesel. EAN Does not apply. ADAPTE LES VÉHICULES SUIVANTS. MUSSO Y KORANDO. Ssangyong Daewoo Musso & Korando models. Ssangyong Musso 2.3i GLS 2295 TF E23 8/97-3/99. Daewoo Musso 2.3i 2295 Y E23 5/99-1/03. Ssangyong Musso 2.9D SE, GSE 2874 TF OM602 5/95-3/99. Fuel Type Diesel. ADAPTE LES VÉHICULES SUIVANTS. SSANGYONG KORANDO K4. KIT PEINTURE ETRIER DE FREIN ORANGE FOLIATEC. COULEUR: ORANGE. KIT DE PEINTURE D'ETRIER DE FREIN. - Un pot de peinture 150 gr. SSANGYONG KORANDO KJ. KIT PEINTURE ETRIER FOLIATEC DE FREIN BLEU RS. COULEUR: BLEU RS. KIT DE PEINTURE D'ETRIER DE FREIN. - Un pot de peinture 150 gr. Daewoo Korando 2.3 Estate 2295 (P) KJ 143 5/99-01. Ssangyong Korando 2.3i Est GLS 2295 (P) KJ. Daewoo Korando 2.9 Estate TD 2874 (D) KJ 120 5/99-01. Ssangyong Korando 2.9 Est LS,GLS 2874 (D) KJ. Ssangyong Musso 2.3i GLS 2295 (P) TF. SSANGYONG KORANDO Cabrio. KIT PEINTURE ETRIER DE FREIN NOIR FOLIATEC. KIT DE PEINTURE D'ETRIER DE FREIN. - Un pot de peinture 150 gr. Le KIT Complet Comprenant. SSANGYONG KORANDO KJ. KIT PEINTURE ETRIER FOLIATEC DE FREIN JAUNE. COULEUR: JAUNE. KIT DE PEINTURE D'ETRIER DE FREIN. - Un pot de peinture 150 gr. SSANGYONG KORANDO Cabrio. KIT PEINTURE ETRIER DE FREIN BLANC FOLIATEC. KIT DE PEINTURE D'ETRIER DE FREIN. - Un pot de peinture 150 gr. COULEUR: BLANC ( WHITE). Fuel Type Diesel. Numéro d'immatriculation du véhicule OU NUMÉRO DE CHÂSSIS DE VIN. SSANGYONG KORANDO KJ. KIT PEINTURE ETRIER DE FREIN NOIR FOLIATEC. KIT DE PEINTURE D'ETRIER DE FREIN. - Un pot de peinture 150 gr. Le KIT Complet Comprenant. (NOTE : FOR 4X2 WHEEL DRIVE MODELS. 1)REAR PADS SET. 2)REAR DISCS SET. KIT CONTAINS. SSANGYONG KORANDO K4. KIT PEINTURE ETRIER FOLIATEC DE FREIN ROUGE MAT. COULEUR: ROUGE MAT. KIT DE PEINTURE D'ETRIER DE FREIN. - Un pot de peinture 150 gr. SSANGYONG KORANDO Cabrio. KIT PEINTURE ETRIER DE FREIN ROUGE FOLIATEC. KIT DE PEINTURE D'ETRIER DE FREIN. - Un pot de peinture 150 gr. COULEUR: ROUGE. Please read full listing description carefuly before you order to make sure the part does fit your car. 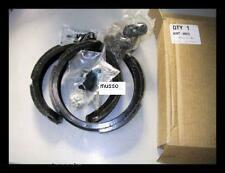 - SSANGYONG MUSSO KORANDO 1994-2001 REAR 2 BRAKE DISCS AND PADS SET NEW. (DISQUES DE FREIN ARRIÈRE 2)(Solide 284mm). 1) JEU DE PLAQUETTES DE FREIN ARRIÈRE. Numéro d'immatriculation du véhicule OU NUMÉRO DE CHÂSSIS DE VIN. KORANDO ALL MODELS 06/1993->03/1999. MUSSO ALL MODELS 07/1994->03/1999. 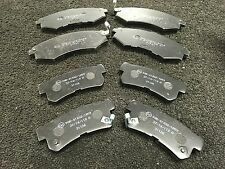 MINTEX FRONT BRAKE PADS. SSANGYONG MUSSO/KORANDO. TheTMD Friction factory based in Cleckheaton, West Yorkshire is state of the art and the technology used to manufactureMintex brake pads has been developed in-house and is capable of producing the variety of references required to service the World vehicle parc. SSANGYONG KORANDO 2.0 À part. SSANGYONG KORANDO 2.2 D 12/1988-12/1996. SSANGYONG KORANDO 2.3 À part. SSANGYONG KORANDO 2.3 D À part. Jeu de 4 Plaquettes de freins à Disques Avants - 5100481300-4813005100. Numéro de GT: GT2706. SSANGYONG KORANDO (KJ) (02.1999-). DISQUES DE FREIN SPORT GT - AVANT. Disques de frein percés et rainurés pour les conducteurs les plus exigeants! Ces disques de frein s'adaptent aux mod?les de voiture suivants. (2) REAR BRAKE DISCS (Solid 284mm). 1) REAR BRAKE PADS SET. You are obliged to take reasonable care of the item. KIT CONTAINS . Brake Pads. Fitting Position: Front Axle. 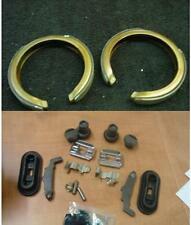 Brake System: #. Our Part No's / OE PART NUMBER VAPADB31676-G. Other Information Width 2: #. Width 1: 61.2 mm. Ssangyong Musso 2.3 08/97-12/98. Ssangyong Musso 2.9 Turbo 04/98-12/98. Ssangyong Musso 2.9 03/96-06/98. Ssangyong Musso 3.2 GX220 08/96-12/98. Daewoo Musso 2.9 04/99-10/02. Ssangyong Korando 2.3 09/97-12/98. GENUINE SSANGYONG KORANDO. BRAKE CALIPER - FRONT RIGHT HAND. Brake Pads. Fitting Position: Front Axle. Brake System: #. Our Part No's / OE PART NUMBER VAPADB1581-E. Other Information Width 2: 59 mm. Width 1: 50 mm. 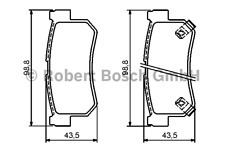 (2) REAR BRAKE DISCS (Solid 284mm). 1) REAR BRAKE PADS SET. You are obliged to take reasonable care of the item. (Reference OE/OEM Number 4840134100. DISQUES DE FREIN ARRIÈRE 2)(Solide 284mm). 1) JEU DE PLAQUETTES DE FREIN ARRIÈRE. Numéro d'immatriculation du véhicule OU NUMÉRO DE CHÂSSIS DE VIN.